The day began early and strong as Rex Grignon guided the audience through his personal and very historical journey of the birth of 3D animation and how he ended up at Dreamworks Studio. It was surreal to see his interview footage from when he was at Sheridan 30 years ago. It would be interesting to see where the industry takes us in another 30 years. Ben McEvoy came down the infamous Corus slide to moderate the “State of the Industry” panel (photo above). Michelle Melanson Cuperus, Brian Simpson, Laura Clunie, Shari Cohen,George Elliott, Juan Lopez and Mark Jones each gave some fantastic insight into their view on the topic as educator, producer and company owners. I don’t think I’ve ever seen a such well articulated individuals in one place before. The topic of industry continued on if you attended one of the next panel which was called, “An Animated Education”. Mark Jones from the last panel moderated this one and had Aubry Mintz, Brooke Keesling, Tony Tarantini and Richard Arroyo talk about what made of their schools bring to the industry. An important point was raised that I never actually thought in-depth before. Each of the schools, such as California State University Long Beach, Calarts, Sheridan and ianimate all have their own methodology when it comes to curriculum and the students will graduate with specific set of skills from those schools. The students will really need to do their research on what it is that they wish to achieve in the industry and which of the many art schools is the best equipped to prepare you for the set of skills you need to land that position. The last talk I went for today was “How I learned to Love Your Portfolio” with Brooke Keesling, Camille Eden, Mike Valiquette, Shirley Andriesh (and a gentleman from Guru studio whos name completely escapes me) moderated by Lance LeFort. This too was also excellent discussion on the topic as they each talk about very specific details on what they are looking for on the projects that are coming up in their studios. Based on a topic such as this, this could easily been cut and dry discussion about very generic what to do and what not to do but I’m very glad all the panelist brought very unique point of view. That basically was the end of the day for me. 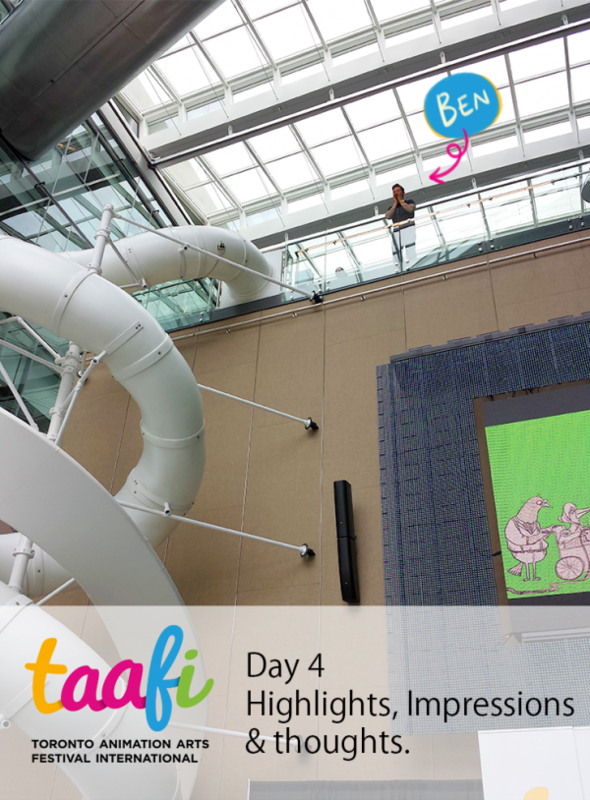 The last day of TAAFI was all very educational for me as I’m still new to the business end of the production so it was great to hear what producers, studio owners and educators had to say. Not to mention they are all wonderful public speakers to boot. To wrap up the whole TAAFI festival weekend, I have few final thoughts. First of all, I think the venue was absolutely great. Having access to two spacious locations that were next to each other really helped bring the events together. The panels and the panelists were all very intriguing and held my interest to the last minute (I have seen fair amount of awful panels at different events where I just sit and roll my eyes). Now for some stuff that I’d love to see improved for the future. My first point has nothing to do with the festival itself but for more the attitude toward these events in the city. The students really need to show up for this. The school is over and this is a festival that is only a transit ride away. The place is booming with potential employers and industry vets that you can approach and talk to. I think TAAFI has done more than excellent job at reaching the students with their ‘welcome to the industry day’ parties, and have worked hard to let their presence well known through other events in the city as well. It is just incredible shame that TAAFI wasn’t booming with 300+ students. Animation Art Maarket , for the first year I think it worked out as well as it could have. However, in the point of view of the exhibitors, perhaps it wasn’t as big as success as what they usually see at other places. I don’t think there is anything specific thing that can be done to improve the interest in the Maarket other than for TAAFI to keep continuing on with it year after year for it to naturally develop. Although, on Day 2(sat.) the Maarket probably should have closed around 5-6PM. I suspect having it open until 8PM was exhausting for exhibitors and volunteers alike. The pre-reserving tickets for the panel process was a bit confusing and perhaps counter intuitive. While it was absolutely great to know what you have a seat for the panel, I wonder if the whole system of reserving a spot in advance (like a month in advance when you purchase pass on-line) discouraged people from attending the talks and even buying the festpass last minute. Many of these panels I went to had good amount empty seats. I can’t help but feel that there must be a good middle ground for all that to work little better for next time. Overall though, absolutely fantastic festival. I’m glad taking Monday off from work was totally worth it. ‘Til next time TAAFI, stay classy. This entry was posted on Tuesday, June 17th, 2014 at 12:22 am	and is filed under News. You can follow any responses to this entry through the RSS 2.0 feed. I agree about the prebooking, I felt that needed flexibility, Otherwise I’d rather just buy tickets to the individual events and forgo the pass altogether. OIAF is annoyingly first come first serve for screenings, and you can only get into panel talks with a pass, this system was better than that, but you really had to study the descriptions carefully to know what you wanted ahead of time, and then there was no way to change it online without purchasing an individual ticket for that event. I really loved TAAFI, the organizers were a delightful bunch, all the events were informative, and the films were all amazing!